"This is a smashing side dish, with an interesting mix of spicy, sweet and sour! Try it and it will be one of your favorites! Delicious with BBQ's or Asian food." Place the mango cubes into a serving bowl. In a separate bowl, whisk together the lime juice and olive oil. Season with red pepper flakes, cilantro, shallots, salt and pepper. Whisk briefly, then pour over the mangos. Stir to coat, then cover and refrigerate for about 30 minutes to blend the flavors before serving. WOW, I LOVE THIS!!! We normally stay away from recipes with no reviews, but took a chance. I only gave it 5 stars because there is not a 50 star button. This was great!! I served it at a bar-b-que. A wonderful summer sidedish. This is really good and really refreshing. 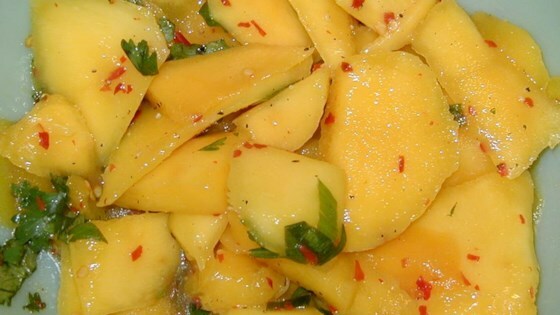 I'd say don't use over ripe mangoes or it will get soupy. ALSO- a really nice variation to try: replace Cilantro with Basil if you like basil more. This recipe is superb! I made it as a side dish with a grilled ginger chicken and it was great. I might try it with fish next time. This one is definately a keeper! A tad too spicy for me, but overall very summery and interesting. Will probably make again with half the pepper.